1964 Lefty Gibson ES-335TDC, Factory Stop Tail, One of One! 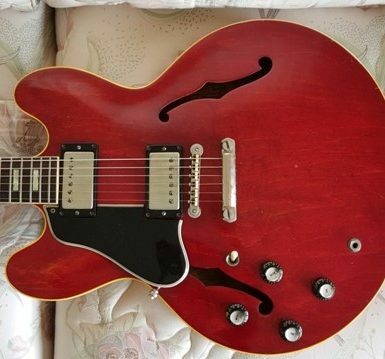 This is a left handed 1964 Gibson factory stop tail ES-335TDC, 100% Original with OHSC, in EXC condition. This guitar has been inspected and set-up by Scott Freilich of Top Shelf Guitars. The guitar features a vibrant and unfaded cherry red finish, Nickel hardware, Patent No. pickups, Kluson Deluxe single-line tuners. It has had a pro refret, has moderate wear, but in EXC overall condition. The Golden-Era 335 is about the rarest category of Lefty guitars; it seems that many years go by before you ever see one. 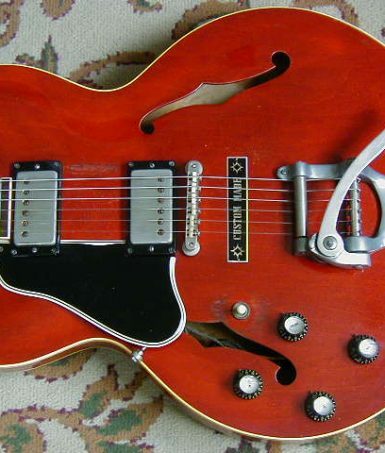 Over the years, I have only seen 5 Lefty 1958-1964 ES-335s. Even on the lefty worldwide database, http://www.lefty-guitars.de/navigation.html, there are only 2 lefty Golden-Era ES-335s listed(those 2 are included in my count of 5). That places the rarity of lefty Golden-Era ES-335s on par with lefty Bursts, which, at last count, included a grand total of 4 currently in existence(Stroup Burst, Florida Burst, McEnroe, McCartney) plus 1 spotted in Buffalo(by a very reliable source) in the late 70s.